After you enable a schema.org type on your site and configure it, you can test the generated markup and make sure it’s valid. 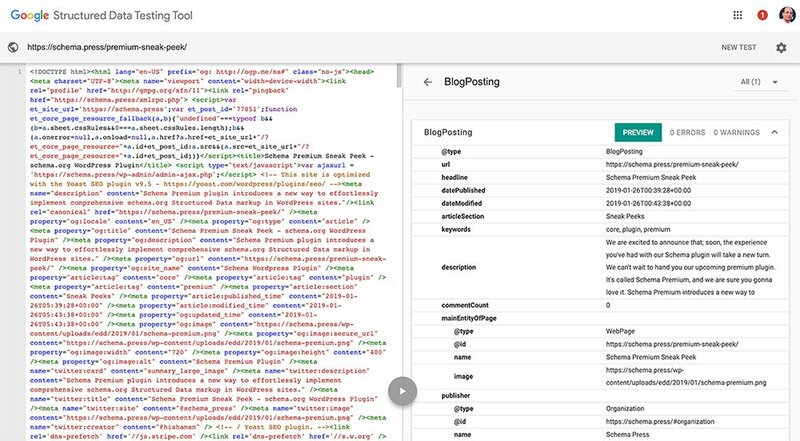 Google offers an official Structured Data Testing Tool that you can use to test your site’s schema,org markup and see if you’ve got a valid markup. This documentation page will explain to you how to test your page markups with a simple click. Depending on the targeting location rules you’ve set earlier to configure the schema.org type, choose a post or a page in the criteria to test validation of its markup. You can fire the Structured Data Testing Tool page on your browser and use a direct link to your post or page to test it. Once you click on that icon in admin bar, you will be redirected to Google’s Structured Data Testing Tool and can view the validation results. If you see errors in the Structured Data Testing Tool, then you can follow the guidelines instructed by Google..